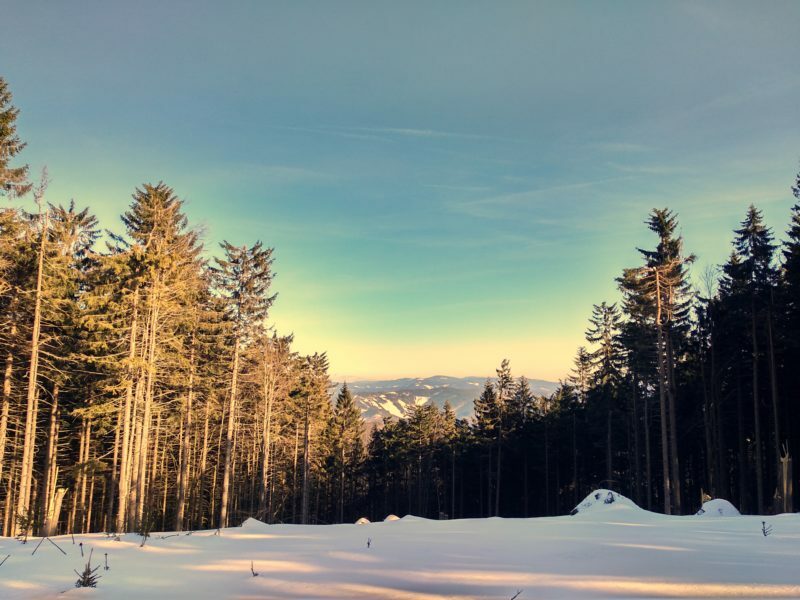 The Beskydy Mountains have some fine choices when it comes to snowshoeing trails in the Czech Republic. Smrk (Spruce Mountain) is not such a popular hiking destination as the nearby Lysa Hora anyway but the south side is less popular still, so it can feel like you’ve got the whole mountain to yourself! The route up the south side of Smrk is steep but not especially demanding or dangerous. Unlike the more popular northern route, it has superb views across the Slovak border to the Fatra and Tatra mountains. The car park at the start point takes longer to get to than the northern route which starts on the main road in Ostravice but that’s another point in its favour for me. Click on the map below to open it in a new tab. Height profile of the route. 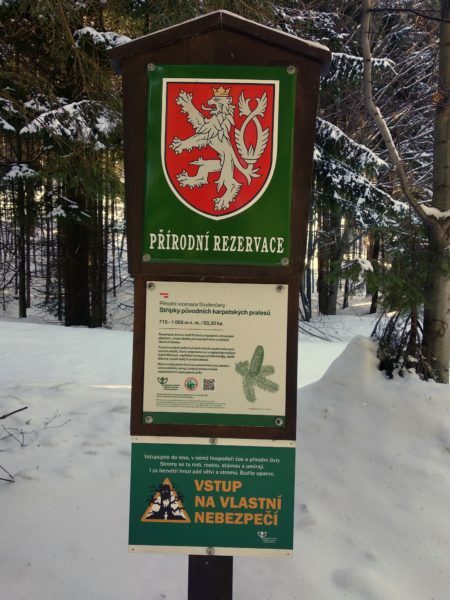 Nature reserve sign – part of the original ancient forest of the Carpathians. Information board about the Wolfram parachute group. Memorial to Josef Biersky, a partisan murdered by a local criminal near this spot. View east across Sance reservoir. View south across the Tatra mountains. The Smrk Mountain South snowshoeing trail starts at the car park of Hotel Srdce Beskyd (Heart of the Beskydys Hotel), which is free of charge. Just before the car park, there is an area used by logging trucks to load up – do not park there! A word of warning before we start: I really, really, recommend being able to use a map and compass when snowshoeing on this trail. If the weather is cloudy on the summit, then I would say it’s essential. 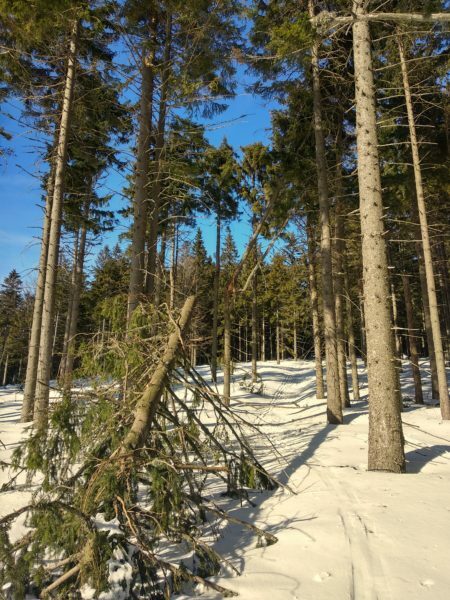 Visibility will be limited, wind chill will be significant and where the forest thins out, there are very few clearly identifiable points on the ground other than the contours. GPS signals on most smartphones can be unreliable in bad weather and battery life can be reduced at low temperatures. 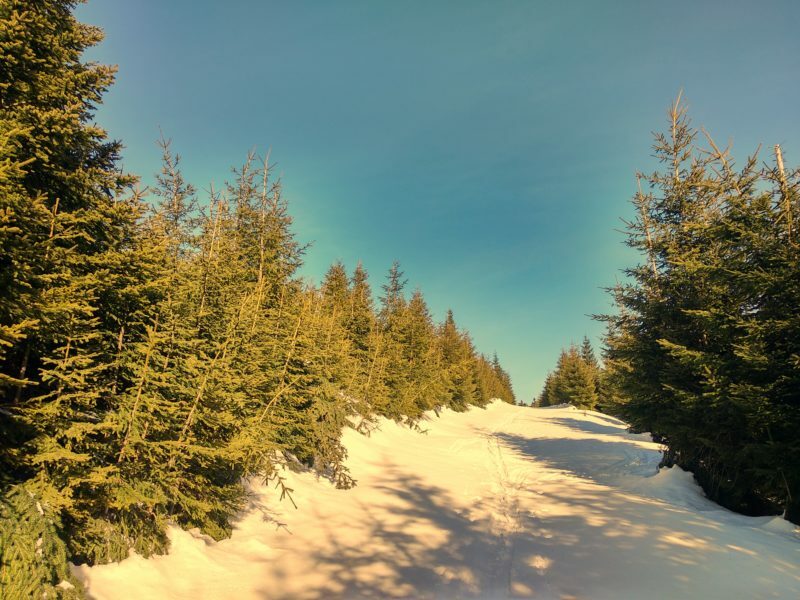 The first part of the trail is on a road but it is not treated during the winter and is often hard packed ice from the logging trucks. You might find ice grips for your boots useful here. It is also part of ‘NS Wolfram’ (Educational Trail Wolfram), which originally had occasional information boards giving information about Parachute Group Wolfram. 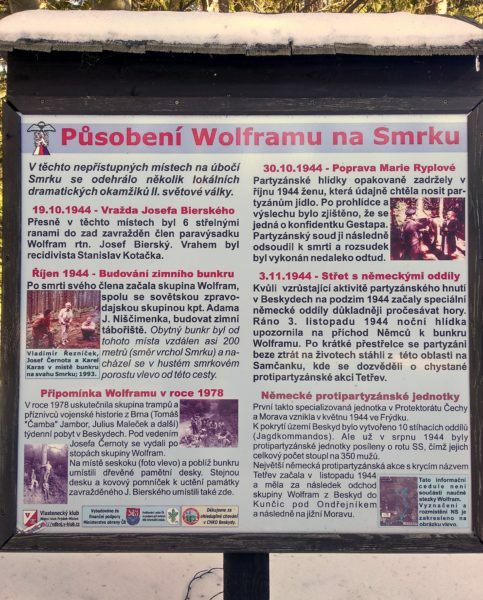 Wolfram was a group of Free Czech commandos trained in Britain during World War Two and parachuted into the area round Smrk in the autumn of 1944. Sadly, some of the boards are gone, others have faded in the sunlight and due to the remote location, they were only ever written in Czech. As time allows, I would like to find the missing information and translate it into English but that’s a subject for another post! 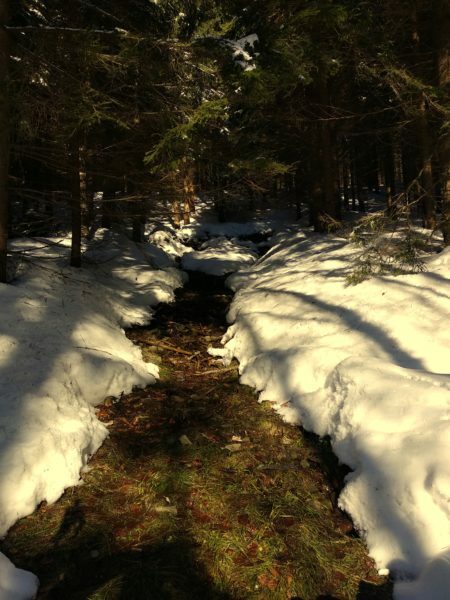 As the Wolfram trail leaves the road and heads up into the forest, the snowshoe trail begins. 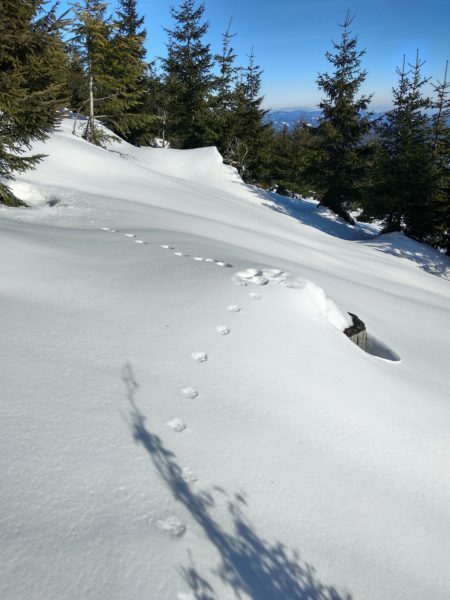 It is also a favourite area for alpine skiers, so watch out for them – they might be coming the other way and be surprised to see you. 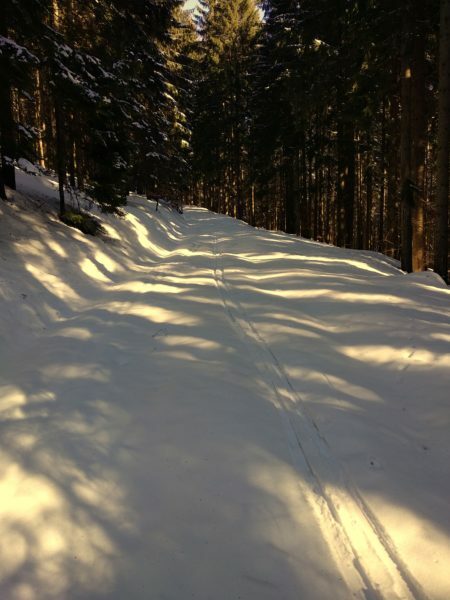 Snowshoeing trails in the Czech Republic are really just hiking trails. 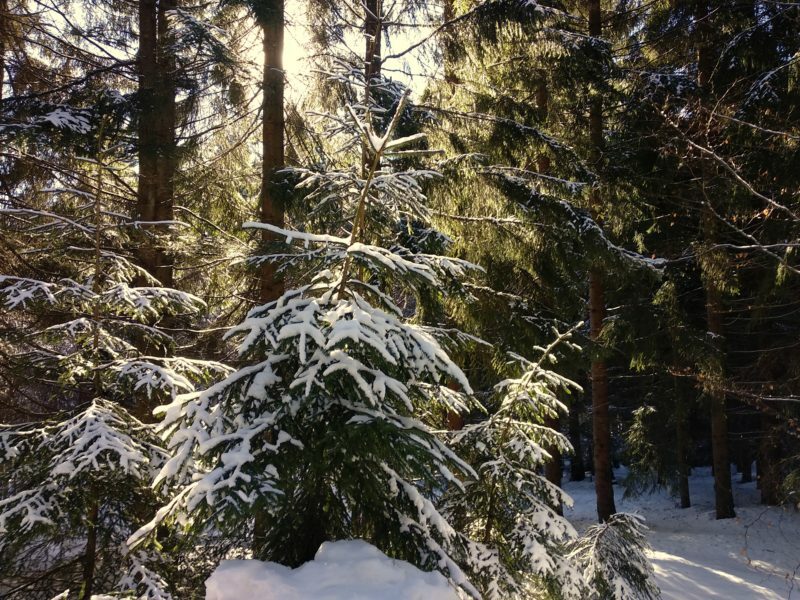 Snowshoeing is not such a popular activity as alpine or cross-country skiing. 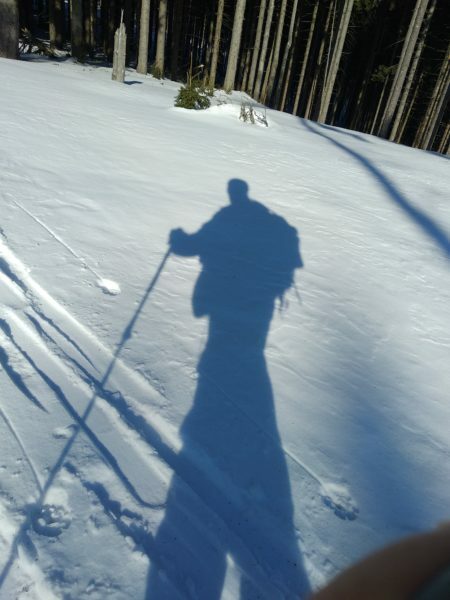 Winter is the perfect time to see who you are sharing the mountains with. 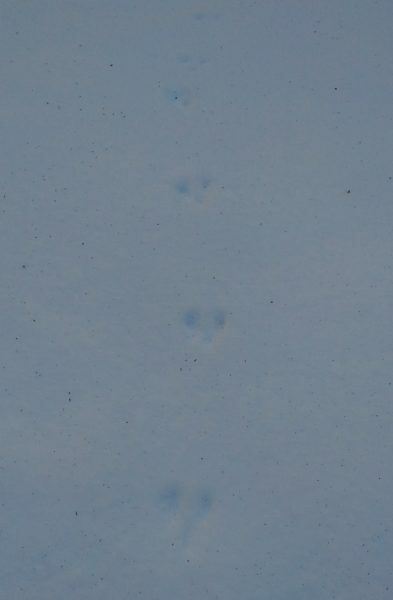 I saw tracks from lynx, rodents, wild pigs, hares and possibly deer, as well as more domesticated animals such as dogs and skiers! 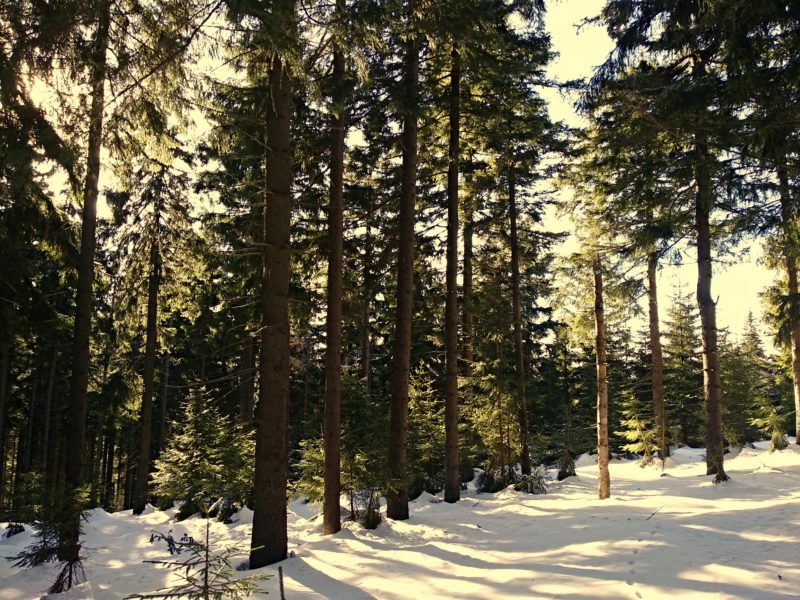 The mixed forest gives way to softwood higher up, mostly spruce with some larch and pine. As you get nearer the summit, they get much shorter and the views open up to the south and east. Just before the thicker trees on the summit is probably the best place to seek out the best landscape photo opportunities. Approaching the summit along the ridge, you really have to pay attention to the contours. 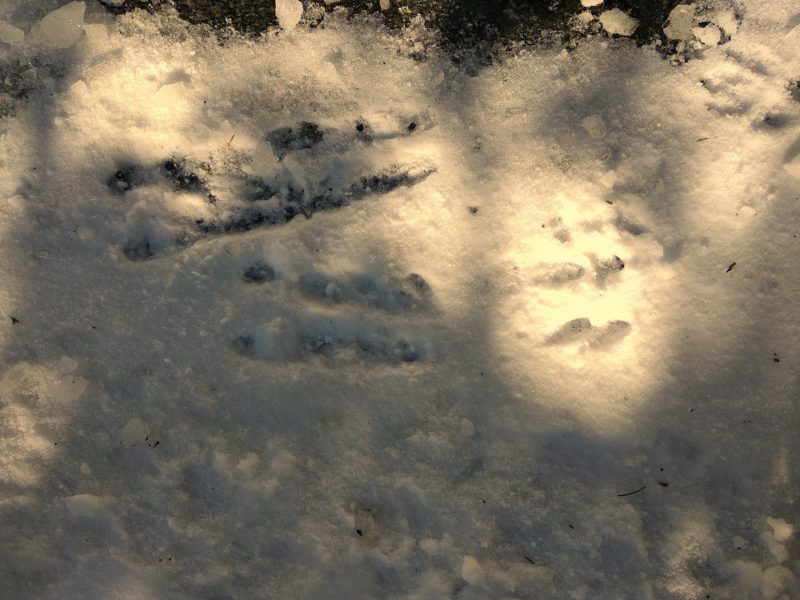 The marked trail (red) is buried under the snow and the marks painted on the trees can be hard to spot at a distance. 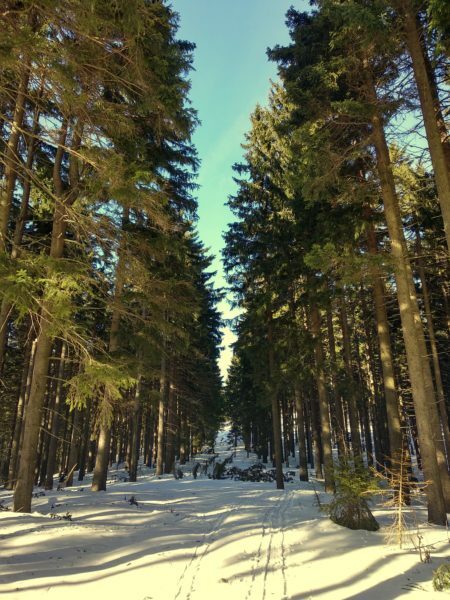 The trees clear and there is a clear marker at the actual summit, as well as views to the north over the Moravian Gate lowlands to the Jeseniky Mountains on the northern border with Poland. 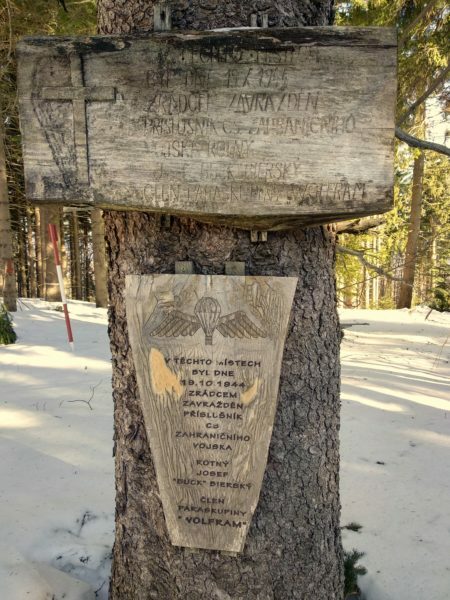 If you continue 150 metres or so past the summit on the red trail, you will pass the memorials to Jan Palach and John Lennon. These were built before the Velvet Revolution by people who held anti-communist views and met up in isolated, inaccessible places like the summit of Smrk where they could speak freely. The route back can be the same as the route up if you like or you can follow the route shown on the map link above. Unless the visibility is bad, the navigation is a little easier. 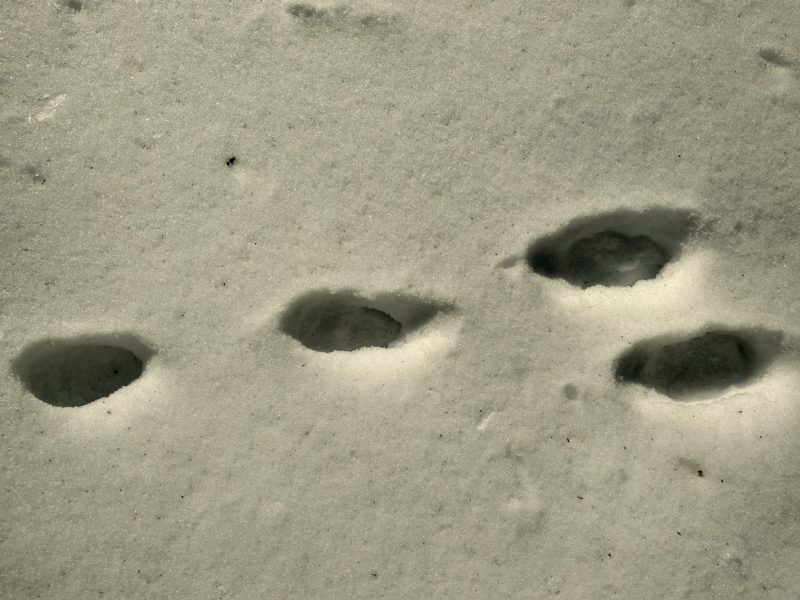 The path is buried under the snow and in the softwood forest, as before, it might be better to follow the contours and keep your eyes open for trail markers. Once you get lower down, by the signpost at Polana and on to the blue trail, the trees are denser and the path is much more clearly visible. Finally, you pass by a meadow with disused ski lift equipment and come to a stone cross by a road. Leave the blue path, turn left through the farmyard and you’re back by the car park. I hope you enjoy the route!